So some people might actually call us insane. Including myself. But we planned back-to-back weekend retreats in September. Oh, and with teenagers. When you say "retreat," you may think calm and peaceful, but when you add in the word "teenager," you know it won't be. But we felt both retreats were really important, so we did it in spite of the insanity. 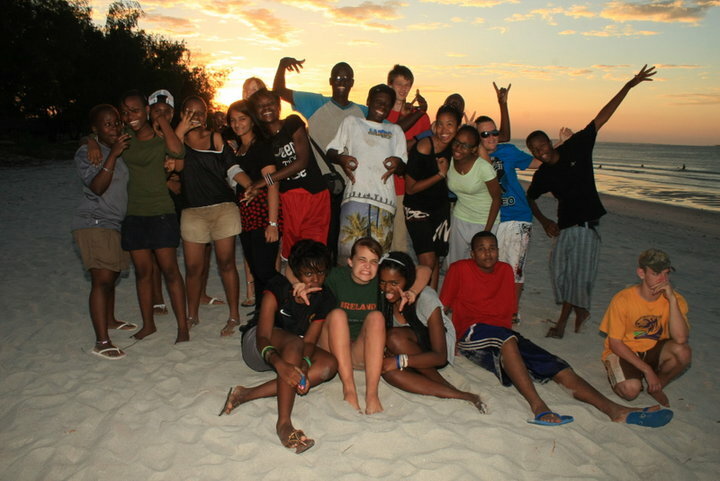 The first was with the entire 11th grade class. 11th grade is weird at HOPAC. For various reasons (which I won't bore you with), we've had half of each 10th grade class leave at the end of the year. So that means that for 11th grade, half of the students have been at HOPAC for years, and half are brand new. Since previous classes have really struggled with this, we decided we would nip those divisions in the bud at the beginning of the school year and take them on a retreat. Our goal: Bonding and shared memories. That's about it. So that's what we did: lots of fun games and lots of fun. Did I mention fun? This was from a game of Extreme Spoons. I love it because it looks like Jenai is going to bite Izumi's leg off (over a spoon, no less). But see? In real life they actually love each other. 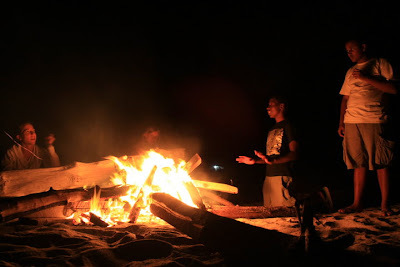 We all decided that planning sessions while at a beach house, eating smores, is much more inspirational than a classroom. ﻿...and this at high tide, just a few hours later. And there's our amazing team for the school year! Tesfaye is Ethiopian, Ab is Tanzanian, Eve is half Tanzanian/half Russian, Anja is South African, and Jenai and Benji (brother and sister)....well, I'm not really sure what they are. They have an American dad and an Irish mom but spent their lives growing up in a variety of other places. In fact, they just got their U.S. passports but have never actually stepped foot in America before. Go figure. About a month ago, a reporter from The Citizen Newspaper (Tanzania's largest English newspaper) contacted us. Our lawyer had given him our contact information because he was doing an article on adoption. After we ensured that this would be a positive article, we agreed to answer his questions and send him some pictures. The article came out yesterday, and what we didn't realize was that out of the four families he interviewed, we were the only ones who sent pictures! So, lo and behold, we found our faces all over the paper. Here's the front page, with Gil and Josiah on the bottom right hand corner. This is the first page of the section where the article was placed. And this is the center-fold spread! Right next to the article titled "Mega meat portions at Coral Ridge Spur." Unfortunately the paper is too big for me to scan, and so far I haven't been able to find the article on-line, even though the paper has a website. So you won't be able to read it. But the reporter did a good job of talking about the cultural issues that keep Tanzanians from adopting, as well as explaining ﻿the red tape that makes the process difficult. A side bar goes through the process that a family would have to go through if they wanted to adopt. He talks about how there are millions of orphans in Tanzania, and so few families will adopt, yet he quotes me and another family on how much of a blessing it is. We're excited! Anything that may get Tanzanians interested in adoption is a good thing. We pray this will help! So we're trying pre-school again. Attempt one was here. We didn't stick with that. I wasn't up to driving 80 minutes a day to give Grace four hours of sitting on a bench. Even though the teacher was a sweetie. But I have been nagging myself about Swahili for Grace. This is her last year before kindergarten. If she's going to learn it, it's got to be this year. And it's just not happening. The neighbor kids come over, but they end up just speaking the few English words they know. My Swahili friends who also speak English (which is most of the people in our community) speak English to the kids, despite my attempts to get them to do otherwise. I've tried so hard to get our house worker and gardener (who is great with the kids) to be intentional about working on Swahili with them. But I think they just don't understand how language develops, so it just isn't happening. I even resorted to hiring a Swahili tutor during the summer to work with them. That was great--just pretty expensive. Sigh. I so much want my kids to learn it. But we live in a bi-lingual city, and are working at a school that's all in English. And like I said in my previous pre-school post, any school that has more than a bench and a chalkboard is in English. But we're trying again. A friend told me about a new pre-school that's less than 2 miles from our house. It is in English (of course), but it's not catering to the ex-patriot population. It's got all Tanzanian teachers and all Tanzanian kids. So I went and observed one day. Technically it is an English pre-school. Any upper-class Tanzanian family who could afford this school (about $100 per month) would want their kids to learn English. But all the kids that go there don't speak it yet. So I listened. All the kids speak to each other in Swahili. 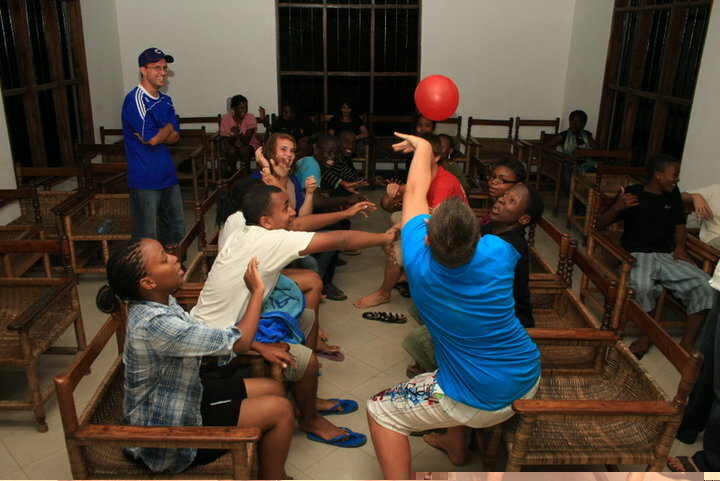 The teachers speak to each other in Swahili. When they teach, it's in English. But other than that, it's Swahili, or a combination of both. We're trying it. I signed her up for three days a week, for three months, and we'll see how it goes. I don't really expect her to learn much in the reading-and-writing category. They do teach it, but they still resort to the classic bench-and-chalkboard Tanzanian method which just isn't very effective with four-year-olds. However, they only do that about 30 minutes a day--and then they sing and play and listen to music. They also eat ugali and beans and drink uji--all very Tanzanian and not really present in our house. So I like that part--I want Grace to feel comfortable eating and acting Tanzanian. And she totally loves it. It's been two weeks, and she's tickled pink (just like those beautiful walls) that she finally gets to go to school. Time will tell if it really helps her learn Swahili. The teachers promised me they would work on it with her. 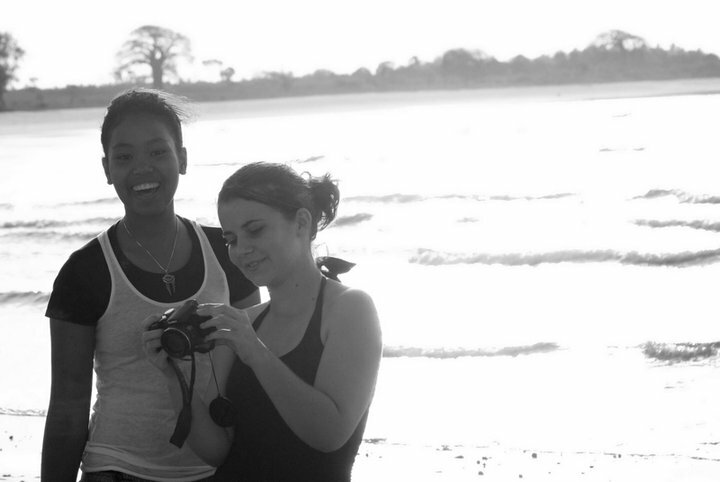 But one thing is for sure: She may not learn Swahili, but she will learn to speak English with a Tanzanian accent. This part cracks me up. So she comes home the other day and says, "Harriet was biting kids today." But she says Harriet with a Tanzanian accent. "Harriet?" I say, very American-like. "No, Mommy, Harriet," with that great accent. Love it, love it! 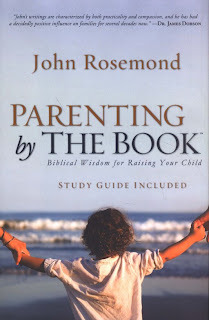 She sings, "Lo, lo, lo your boat," and "Ren, ren, go away, come agen anoter day, leetle chidren want to play futball and netball...."
John Rosemond is a family psychologist who later became a Christian, which subsequently revitalized his view of parenting. So he's got both perspectives. His history of parenting philosophies was fascinating. And basically the whole book is about throwing out the notion that a high self-esteem is the ultimate goal of parenting and re-adopting the idea that character is far more important. He writes, "I cannot emphasize enough that according to both the Bible and good research, possessing high self-esteem and being a person of character are incompatible." He also goes back to that biblical notion that children are naturally evil and selfish and essentially have to be forced to be otherwise. Therefore, the idea that simply "reasoning" with a child to make them behave, or even using rewards and consequences just won't work. He says that good parenting is a matter of being a good leader, and that means being loving but also being very firm. Great Quote of the Day: "No matter how good a parent you are, your child is still capable on any given day of doing something despicable, disgusting, or depraved." I liked it because I agree with pretty much everything he wrote. So I didn't necessarily learn much that was new, but it did give me more confidence as a mom that what I am doing is okay. That it is okay to be really firm with my kids. That it is okay to not come running every time they cry. That it is okay to expect a lot out of them--that Josiah can put his clothes away and that Grace can make her bed and set the table and peel carrots and grate cheese. For example, when Josiah whines for milk, and after making him ask "the polite way" (which seems to be our routine 50 times a day), I don't need to immediately drop what I am doing and get him the milk. When we are in the car and Grace asks to listen to kids' music, I don't need to do it every single time. Sometimes (gasp) we can listen to grown-up music. I don't need to entertain my children all day long. My life does not need to revolve around them. And yet, spending time as a family is far more important than making sure they are "well-rounded" and involved in all sorts of outside activities. I did these things, but I still struggled with guilt all the time. I have wanted them to learn independence, patience, responsibility, and self-control, but I always wondered, "Am I just being selfish? Is it really okay to make him wait for his milk?" So now I don't feel guilty about that anymore. Rosemond says, "My mother, typical of her generation, had no problem shooing me out from underfoot, even telling me I had no permission to be in the same room with her if she was doing something that required her undivided attention. At those times, she would usually warn me that if I didn't find something to do and leave her alone, she would find something for me to do. In that regard, my mom was typical of her generation. Today's mom is horrified at the mere thought of telling her child that something she is doing is more important than something he wants her to do." Of course, I do still struggle as a Mom. The truth is, I am selfish sometimes. Um, a lot of the time. And grumpy and impatient. I have to work on my own sinful nature even more than my own kids'. So figuring out that balance is a daily quest. I would recommend this book to anyone. He uses biblical wisdom but it would be applicable to parents from any background. The Mommy Quest continues! This is just one more great resource along the way.